Visual Studio 2003 and Compact Framework 1.1? I'm trying to use filehelpers on a project in visual studio 2003 for compact framework 1.1 but it doesnt seem to work. Should it work or is cf 1.1 just too old? "The process cannot access the file"
the reason is the file is already opened. Is there any option to check whether the file is already opened or not. Thinks for a great library. We are using the following code to read a table of data where the number of columns are not known at build time - only at run time. We provide a DataTable to the Classbuilder to specify the required columns. This works fine in most cases but unfortunately if the last column is of type "uint" and the file happens to contain additional columns we were not expecting it does not trap the error and gets the data in the last column wrong. Can you suggest what we may be doing wrong or if there is a workaround for this issue - please bear in mind we have no control over the source files we are reading so need to trap the error so we can inform the user. I need to sort large text files (+4GB). But what about using a substring? Tengo un problema porque siempre me funciona ben el sort con archivos menores de 10MB. Pero cuando son archivos mas grandes (+20MB, y hasta 3GB) no se ordenan bien. Estuve investigando y creo que el problema es al hacer el merge de los archivos que ya estan ordenados en TEMP. Revisando los archivos de TEMP si estan ordenados los datos dentro de cada archivo. Pero al momento de hacer el MERGE de TEMP-->OUTPUTFile no se ordenan. Lo que se me hizo raro es que mi funcion de Camparison se llama siempre mientras es la primera fase del sort, osea mientras se estan escribiendo al TEMP, pero ya cuando se toman del TEMP para juntarse en el output file nunca se llama nuevamente a la funcion de Comparison, no se si es correcto esto o no? Cual es el lugar correcto para agregar un reporte del problema? en el foro o directamente en GitHub? Gracias, espero que me puedas ayudar porque lo necesito urgentemente. Estas usando la última version de la libreria ? Hello, I posted or rather tried to post a question on the FileHelpers forum (http://www.filehelpers.com/forums/) about an issue I had. It appears that no one is really monitoring the site along with it being bombarded with spam. Anyway, I currently have an issue that seems to have come up with a project that I have. I'll describe the process of my program first. My program is designed to go out daily to retrieve a .zip file using SFTP from our bank. 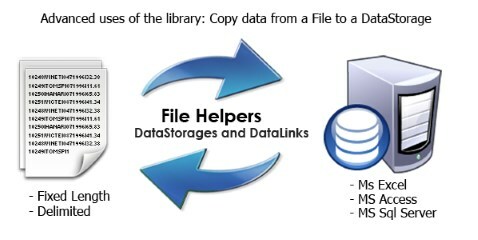 After getting the zip file, it extracts the zip to a new location and goes looking for a csv file that is in it. After it finds the csv file, the program tries to read the data to eventually write it into SQL Server. Finally, I do some cleanup with moving the zip file to an archive folder and delete the extracted files. Ok, initially I was using OLEDB and everything was great. However, anomalies came up with extremely large numbers being blanked out for one column for some of the records at times. This led me to research and eventually use FileHelpers. The data is being stored correctly now without any anomalies. However, I now have an issue with deleting the extracted files folder as part of my cleanup routine. I'm getting "The Directory is not empty" which I can only assume means that the new code somehow has its hooks in the CSV file. I never had an issue with OLEDB for removing the folder. My code for using FileHelpers currently uses 2 objects to read the csv file. After that, I set the objects to Nothing as you can see below. Anyway, my program is now at times working as it should with deleting the extracted folder. Other days, I get the "The directory is not empty." error. Does anyone know how to resolve this issue? Re: The directory is not empty. Setting the engine and cb objects to = Nothing does not immediately clear them from memory nor release all their resources. You might try expressly closing the engine object. If that does not work, you could add a Thread.Sleep() call for, say 0.25 of a second or so to allow garbage collection to catch up. If that fails, you might also try adding a DoEvents() call before deleting. 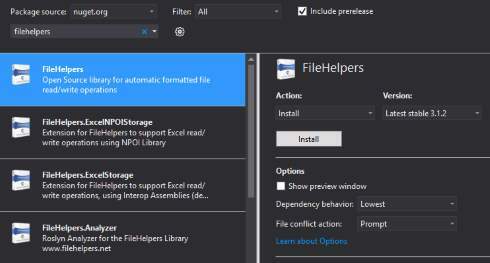 You should place these attempts to delete the folder within a loop that traps and ignores the deletion error for a specified period of time. While it probably won't change FileHelpers behavior for this issue, I do recommend using the latest unofficial release. It has many new features and fixes a number of troublesome bugs. See my previous message for instructions on downloading the binaries. Click on the "Login as a Guest" button after opening this link. I used this library for years and can recommend it enthusiastically. The latest version has many fixes and improvements over the 2.0 version posted on this forum. 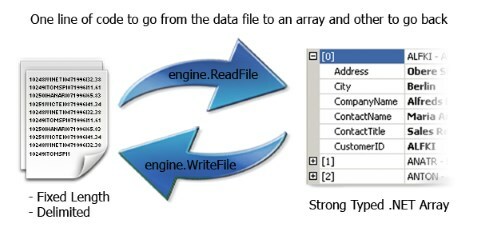 It also supports .NET Framework v4.0 and MS Excel 2010 files. I have used v2.9.10 to import and export many different and complex file types without any problems. I suggest that you not pester Marcos for support of this latest version as he has not officially released it. Primero que todo te felicito por tu codigo y te doy las gracias por compartirlo. Yo ya tengo seteada la clase con delimitador por ejemplo punto y coma (;) pero el archivo a cargar tiene como separador el pipe (|) puedo cambiar el delimitador en tiempo de ejecucion. Estuve viendo la documentacion pero hay un ejemplo para cuando se crea un archivo, pero no cuando se lee. ¿Se hace de la misma forma cuando se crea un archvio que cuando se lee, y si es posible que escribas un pequeño ejemplo de unas pocas lineas? I really like your library, I use it a lot but I got some trouble with Excel files. everything workes fine if the Excel file is complete. But if there is an empty field in the first colum, the engine stops and thinks the Excel file is finished, but it isnt't. How can I fix this? I have converted your wizard to a web app if you want it for your next release? Its not pretty but it works. then I want to store the record in a BLOB or XML file for later reloading and using in the same dynamically late binded class / dll. I know reflection is the key here but I was wondering if you have this done anywhere in your framework that I can simply call. 1. Very important, the attributes do not work on properties, which makes me create new classes just to have public fields. 2. Also very important, derived from first issue, does not take into consideration computed properties. 3. Usually a csv has also the column headers, this one doesn't allow them. Sure, I can pass in an array of strings, but is not nice. I have a CSV file where the Date and the time are into 2 fields. How can I use FileHelpers to aggregate the 2 fields into the same DateTime data ? I have a CSV file where the Date and the time are into 2 fields. How can I use FileHelpers to aggregate the 2 fields into the same DateTime data ? I am needing to create a csv file, and this tool is execellent. One thing I am struggling with is that the CSV file needs the first row to contain the field names. I tried setting FileHelperEngine.HeaderTxt, but this just puts the whole text in the first field. I'm currently using LINQ to CSV library[^]. It's a good library reading and writing CSV files. It can handle all kinds of formats if only they comply with the CSV. 1. I cannot read part of the fields, which means, I have to read all fields from the file exactly as how the Data Class is defined. This makes the library less flexible: we cannot read the CSV file (written with DataClass1) with DataClass2. 2. How to Import/Export Dynamic Number of Fields in a Class? // because the number of years is dynamic. So, can FileHelpers do the missing features as I mentioned above? Thanks.